The ultimate in stress-free Italian travel is to journey by train. Enjoy the ride, look out at the lovely countryside and even take a nap while you're whisked from one city to another. If you're traveling between Italian cities, the train is definitely the way to go. All the train stations are centrally located so getting to your hotel is much easier than from an airport. For major city routes, hop on one of LeFrecce high-speed trains, which will get you where you're going quickly and in comfort. You might want to pay a little more for a first-class ticket for a roomier seat and complimentary drink and snack. 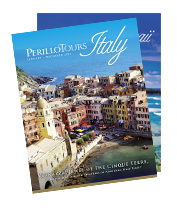 Be sure to book your train tickets with your Italy Vacations package! Leave yourself enough time to find your track once you get to the train station. Provide the PDF ticket to the conductor upon boarding your high-speed train or simply show the PNR code on the display of your smartphone or tablet. No validation required. Provide the PDF ticket to the conductor upon boarding your regional train. Printing the PDF of your ticket is compulsory. No validation required. By traveling by train in Italy you can reach the most famous art cities and also the smallest destinations. Frecciarossa and Frecciargento high-speed trains will let you reach all the main Italian art cities. Frecciabianca trains run from big cities to medium-size towns. InterCity and Regional trains connect big, medium and small destinations on a widespread network.